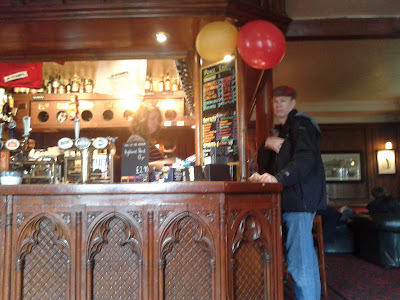 This pub is famous for its walled beer garden, but the weather had turned cold so we found ourselves enjoying the charming interior. Swansea was playing Newcastle on the telly. Meghan remarked that watching soccer was like watching a game of Pong. That is me up at the bar ordering my first ever Worthington's White Shield IPA, now brewed by Molson Coors. Here's something you don't see everyday: a pregnant woman enjoying a pint. Not me... the woman over my right shoulder! And then here she is nipping out back for a smoke before ordering another round. It was heartwarming to see her mate doing his part to support the pregnancy by choosing to drink and smoke with her.